Yesterday we shared 2 Simple Dog Crafts inspired by Lois Ehlert's book RRRALPH! Since my daughter loves cats and dogs right now, we decided to do a cat craft as well. We checked out Top Cat by Lois Ehlert at the library and enjoyed reading it together and looking at the pictures. Top Cat is a book about a cat that rules his house until a new cat arrives on the scene. Top Cat isn't too excited about the new addition to his household and doesn't want to share his things. Eventually he learns that sharing and playing together is more fun. My toddler loved repeating the different words and phrases in the book as I read them. She acts a bit like Top Cat when it comes to sharing her toys with her brother, so this was entertaining to read. I can imagine her acting a bit like Top Cat when our new baby arrives in about two months too! Do you have any kids or pets who act like Top Cat? My toddler and I had an entire morning alone last week, so we had fun crafting together. Materials Needed: black posterboard cut into cat face shape, paint stirrers or long sticks, googly eyes, crayons, glue, paper scraps, tape, and scissors. 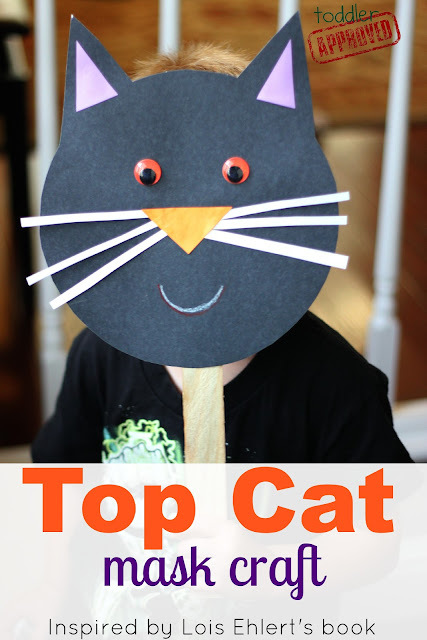 Add some glue and attach the nose, whiskers, and anything else you want to include on your cat to the cat template. Tape a paint stirrer or another long stick to the back of the cat's head. 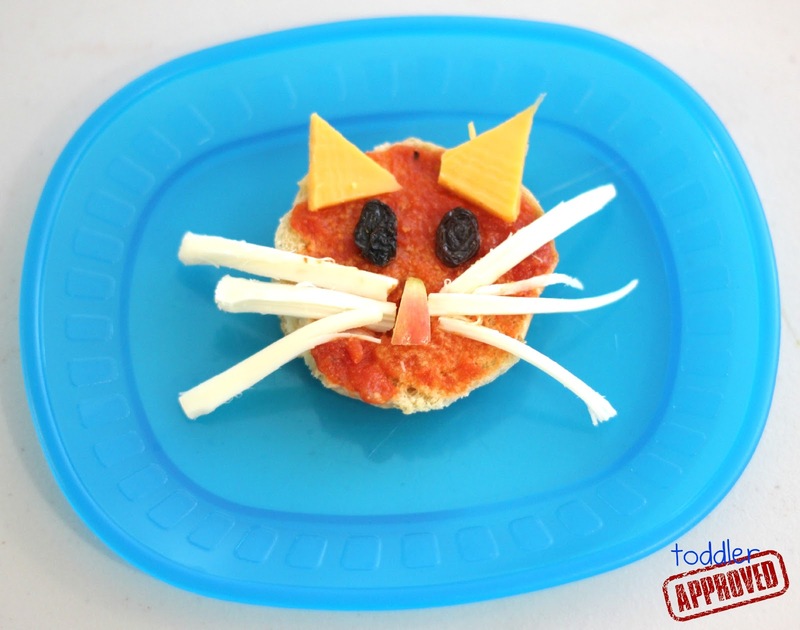 We also made a Top Cat snack using some of my daughter's favorite foods around the house. To many, the combination of these items sounds gross, but she absolutely loved them! Cheese stick whiskers, sliced cheese ears, raisin eyes, apple piece nose, tomato sauce face on a mini slider bun. 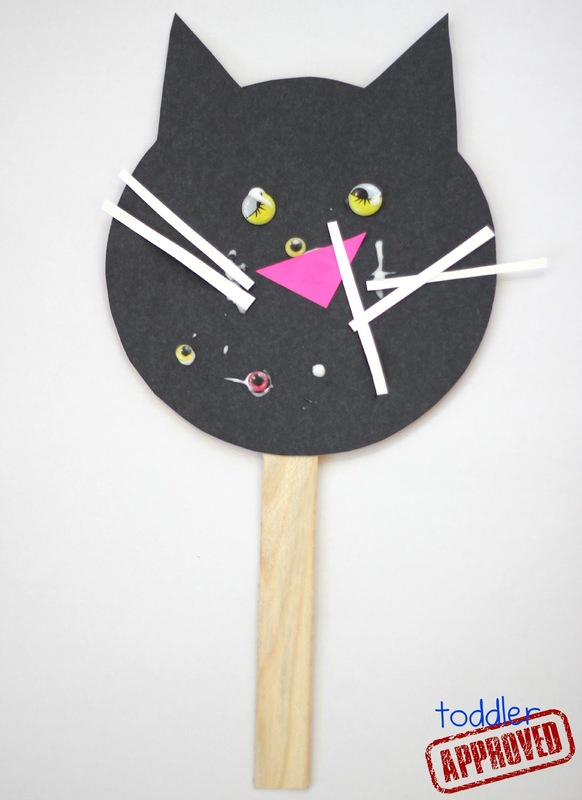 Do you have any other favorite cat themed activities or crafts you've enjoyed? This is so cute! I came across your blog from pinterest looking for new crafts for my students! thank you!!! Both the mask and food creation look wonderful.